File Lock 6.1.2 free download. File Lock is a security application that can lock and/or hide your files, folders and drives. File Lock is a security application that can lock and/or hide your files, folders and drives. It can deny access to any of your files, folders or drives. File Lock also supports to hide files and folders, to make them to be completely invisible. The locked items will be denied access, move and deletion, the hidden items will not be found by any program or the Windows Explorer. File Lock supports all NT-base Windows systems included Windows NT/2000/XP/2003, supports FAT, FAT32 and NTFS, CDFS file systems. File Lock is very easy to use, just choose the "Lock File...", "Lock Folder...", "Lock Drive..." menu item to lock any item on your computer, click "Modify" to modify any locked item, select the "Hide this item" option to hide the selected item. Click "Unlock" button to unlock the selected item. File Lock supports schedule options, you can set the schedule option for each locked/hidden item, to specify how to lock/hide the item. For example: if you set the schedule option as "Daily" and set the start time as "8:00", end time as "17:00",then the item will only be locked/hidden in the time period of 8:00 to 17:00. File Lock supports multiple users, each user can lock and manage her/his own files/folders, only the administrators can view and manage all the locked/hidden items. File Lock provides plug-ins to help you encrypt files, disguise folders and launch trusted programs. "Disguise Folder" tool can disguise any of your folders as special folder in Windows, such as Recycled Bin etc; "Trust Program" tool allows you to launch any program that will be trusted by File Lock. A trusted program can access the locked/hidden files/folders. Kernel mode protection, uses low level driver to protect your files/folders. Supports multiple users accounts, each user can lock her/his own files. Supports schedule features, let you specify when your files will be locked. File Lock can also protect your files/folder under Windows Safe Mode. Supports drag and drop feature so that you can drag any file/folder to the software to lock them. Supports context menu, just right-click at any file then choose the menu item "File Lock" to lock or hide it. Supports to run trusted programs, the trusted programs can access the locked files. Password protects the File Lock main program and its uninstaller. Users can change the display font. File Lock can remove itself from the start menu, hide itself from the "Add/Remove Programs" list box, of course you can show it again at any time. With EZ Lock & Hide you can lock your favorites folder, jpg images, mp3's, etc. With CD-ROM Lock you can prevent your CD-ROMs from using with just one click. Lock Folder XP is a new security tool that lets you lock your files, folders and drives with your personal password. Chameleon Clock is a desktop clock which purpose is to be useful, user-friendly, and beautiful. Desktop Lock is a computer security protection and access control software product, you can use it to lock computer to prevent people from accessing your private documents and resources. 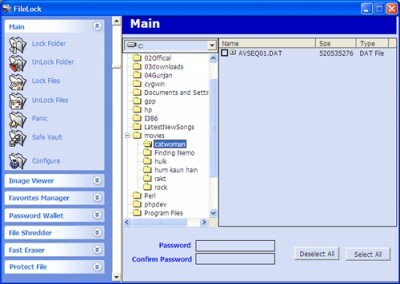 MSN Password sniffer is a useful and handy utility that can capture MSN passwords. System Lock will allow you to lock your desktop so that no other users may use your PC. Lock and unlock any program on your pc so it cannot be used.